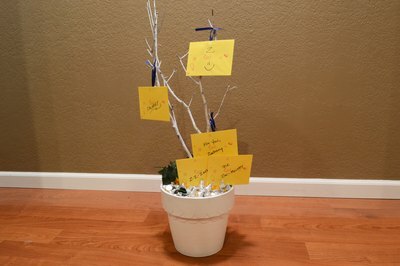 A gift card tree is a variation of the money tree and offers you a thoughtful gift option for a person about to graduate, have a baby or retire. Making these gift trees presents few if any challenges. You can enhance them further by adding more decorative elements to the base design or tying money to the tree’s branches and dropping loose coins into the tree’s base. 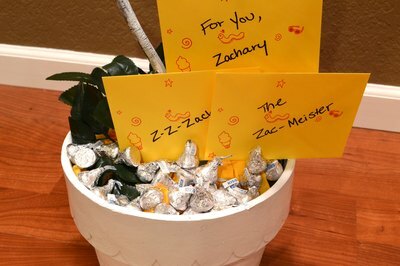 With just a little coordination on your part, you can create a memorable and personal gift for someone who’s celebrating a very special day. Collect the cards you’ll give as part of this gift. This requires some work ahead of time. You want the people who’ll fill out the cards for the gift recipient to have them ready and back to you before you begin making the project. 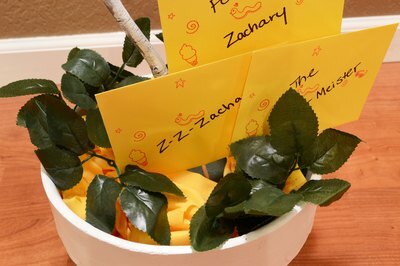 One way to do this is to buy a dozen or so inexpensive cards at the local dollar or five-and-dime stores and pass them around for people to sign or write sentiments inside. Let them know when you’ll collect them, taking care to ensure that your gift recipient doesn’t find out about them. Find and clean some interestingly shaped tree branches. These will form the base for your gift card tree. Aspen or lilac branches are pretty, but any type of branch will do. 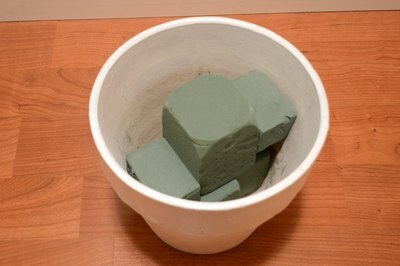 Place the florist’s Styrofoam in the bottom of a terra cotta pot. You want a piece that’s large enough to fit snugly in the bottom of the pot, but you don’t want it to fill the bottom of the pot all the way to the rim. Keep a space at the top of the pot--about 1 inch--because you will add items later. 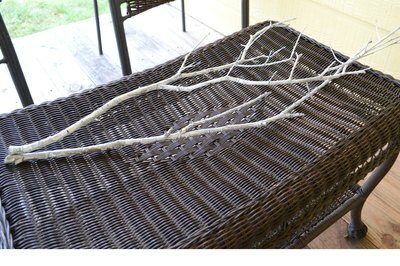 Stick your clean tree branches in the middle of the foam. 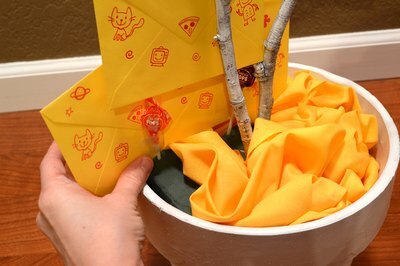 Attach some of the cards to the branches of the trees. To do this tape a bit of ribbon onto each card. You want to tape in the middle of the ribbon so you can tie the ends to the branches. Leave the cards in the envelopes so your gift recipient has something to open. 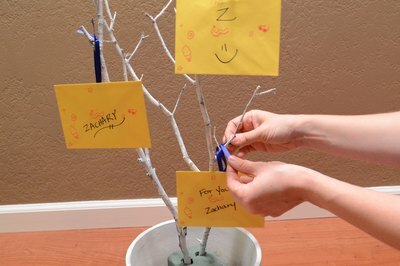 Tie the cards to the branches of your card tree. Open the bag of suckers. Leave the suckers in the wrappers. Tape the remaining cards onto the heads of the suckers with the colored tape. 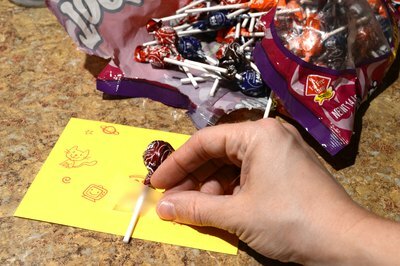 You can add variety to this by taping some cards onto the suckers diagonally. Plant the suckers into the foam, making sure that you evenly distribute them around the branches in the center of the arrangement. 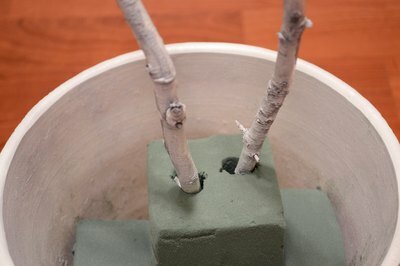 Place small branches of silk olive or grape leaves at the bottom of the pot so that you cover the Styrofoam. These branches function as "ground cover." Typically with silk leaves, several small stalks of leaves cling to one larger vine and you can remove the small stalks from the larger vine. 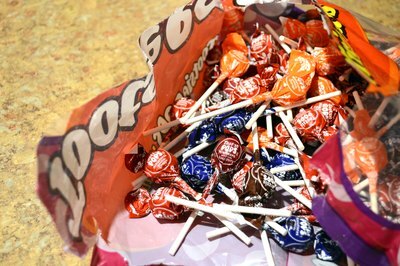 Add candy Kisses and coins to the bottom of the pot covering the leaves and any remaining foam.